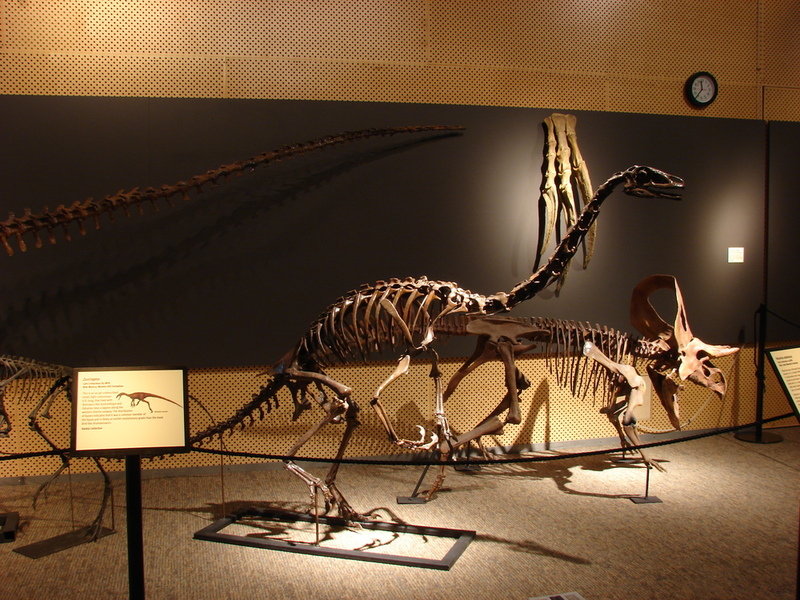 Falcarius utahensis is an important fossil skeleton to researchers and a bizarre animal to behold. About 13 feet long and 6 foot tall, it's lumbering posture, long neck, and short tail make it look like a single dinosaur made from parts of several other varieties of animal. Intact, this approximation is nearly accurate as most researchers agree that this specimen is a transitional form between the theropod dinosaurs and their decendents the therizinosaur dinosaur group. Falcarius takes it's name from the latin word for 'scythe' or 'sickle cutter', a reference to it's unusual looking hands and disproportionate claws. It's teeth, and also the shape of it's neck, indicate that Falcarius utahensis fed on vegetation, fruits, and occsionally small animals like reptiles and mammals living in the shrubbery.